In the prestigious 16th arrondissement, just a short walk from the Eiffel Tower, the Best Western Premier Trocadero La Tour offers a welcoming retreat in heart of the city. Each of the 41 spacious and well-appointed rooms is a haven of calm, offering the comforts of home after a long day out sightseeing or shopping. Breakfast is served in a bright and airy room that opens onto a verdant patio. Enjoy a cocktail in the lounge and bar in a mellow atmosphere reminiscent of old English social clubs. 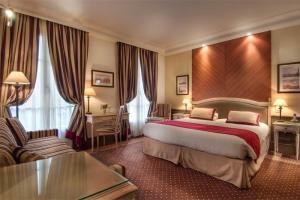 Located approximately 20 miles from Charles de Gaulle Airport; Orly airport is about a 13 miles away. Boullainvilliers Station and the Passy Metro station are both a little over a quarter of a mile away.